We can undertake surveys that address all of the above current methodology, and also more quantitative established guidance set out in the relevant British Standards and Good Practice Guides. 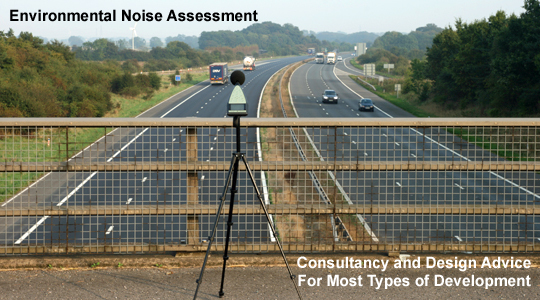 Planning surveys will usually involve the acoustic design of a mitigation scheme that minimises the impact of noise on quality of life, and maximises the feasibility of the proposed development. British Standard 4142 is used for the assessment of industrial noise affecting noise sensitive premises and has existed in various forms for several decades. The latest version of BS 4142 was released at the end of 2014 and includes significant changes in the measurement and assessment of industrial noise. We have the qualifications, equipment and expertise required to undertake surveys in accordance with this new standard. We have extensive experience in the planning and noise monitoring of live music festivals and other entertainment events. Guidance issued by the Noise Council on Environmental Noise Control at Concerts is used to quantify music noise as received at nearby dwellings. Monitoring is usually undertaken at all times when music is played over the course of a festival lasting several days and we can stay on site if necessary to provide a round-the-clock service. We can work with the event organisers and sound engineering companies before the event takes place to ensure that the design of the event is acoustically intelligent and the feasibility of the site is maximised. Useful information is fed back to sound engineers during the event to ensure that the sound quality at front of house is optimised while levels at nearby dwellings remain within the requirements of the local authority and licensing. Third octave analyses are performed on measured results so specific requests can be made for adjustments on individual instruments and at particular problem frequencies – we won’t just tell you to turn it down! We have conducted sound power and sound pressure level testing on a wide variety of products, from small scale single fan air conditioning units and heat source pumps to large scale air handling units for use in off shore oil rigs. The Sound Power Level (SWL) is intrinsic to the object – rather like the wattage of a lightbulb – and is independent of the environment it is in. The SWL is sometimes displayed on noisy items of plant and machinery. Sound power tests are usually conducted to BS 3744. There are other British Standards that apply to specific types of application. Please contact us if you require sound power testing and we shall be happy to discuss your requirements with you.